The time for dabbling in the cloud is over, according to industry analysts. 2013 is the year that companies need to implement a serious cloud strategy that puts certain workloads in the public cloud and retains other workloads in-house. 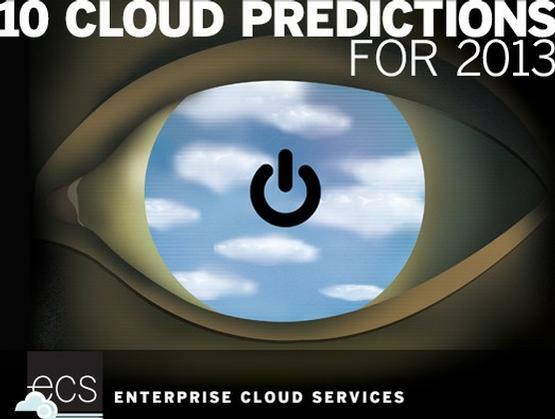 Here are 10 predictions for what we’ll see happening in cloud computing in 2013. As enterprises get down to the business of analyzing which apps are appropriate for the public cloud or the private cloud, IT execs will quickly come to the conclusion that a hybrid cloud approach makes the most sense. “I’m convinced 2013 is going to be the year of the hybrid cloud infrastructure,” says Tracy Corbo, principal research analyst at Enterprise Management Associates. If companies make the move to hybrid clouds, then it will be critical that IT execs are able to manage both the public and private pieces of the overall cloud infrastructure. Luckily, there are companies that can help, starting with RightScale, which has been offering cloud integration management since 2006. Other players include Cohuman, Okta, Scalr and Tier 3. IDC predicts that by 2015, nearly $1 of every $6 spent on packaged software, and $1 of every $5 spent on applications, will be consumed via the Software-as-a-Service (SaaS) model. So, who handles the integration of all these apps? Cloud service brokerages. And who develops security and auditing around these apps? Who creates B2B links with partners using the same apps? Cloud integration hubs. Startups include Cordys and Informatica. Big data – the analysis of vast amounts of unstructured data – and the unlimited compute power of the cloud are a match made in heaven. The major vendors are jumping on the big data bandwagon as evidenced by HP’s purchase of Vertica and Autonomy, IBM’s purchase of Netezza and EMC’s purchase of Greenplum. And there are plenty of Big Data analytics startups, such as Metamarkets and Datameer. In July, VMware spent $1 billion for SDN startup Nicera. Last month, Cisco paid $1.2 billion for Meraki, which provides networking systems that can be managed from the cloud. What’s it all mean? “All of these moves just point to the eventual realization that software defined networking is just going to collapse back into a new definition of networking that is going to evolve in 2013,” says Terremark CTO John Considine. As companies move to hybrid clouds, vendors are expected to keep pace by offering security in two flavors – traditional appliance-based security products for on-premise access, plus security-as-a-service to shore up security for mobile devices. IDC predicts that over the next three years hybrid deployments will make up 60% of all deployments. IDC also predicts that the market will balloon to $3.3 billion by 2016. Standard offerings in the infrastructure-as-a-service world will expand to include things like WAN optimization-as-a-service or load balancing-as-a-service. “It’s not a question of being able to do this stuff in-house. It’s a matter of figuring out if it’s cheaper and more efficient to do it in the cloud,” says Tracy Corbo of Enterprise Management Associates. Despite the best efforts of the cloud services providers, be prepared for outages. “Outages will happen as a matter of course,” says Gartner’s Lydia Leong. “It can’t really be helped when you take into consideration all of the permutations of all the services riding on these infrastructures. There is no way every contingency can be tested for.” That means it’s up to enterprises to take the initiative when it comes to backup plans. Gartner predicts that by 2014, 70% of all Fortune 2000 companies will have at least one cloud-based application that employs game theory to influence employee or customer behavior. Gamification is the concept of applying game-design thinking to non-game applications to make them more fun, engaging and addicting. Applications in the business world include boosting sales, encouraging collaboration and information sharing among employees and partners, and increasing customer service satisfaction. Market leaders include Badgeville, BunchBall, Crowdfactory, Gamify.it, Hoopla, Kudos, ObjectiveLogistics and Rypple (a salesforce.com company). Did You Know Cloud Computing Has Been Around Since the ’50s?